The map from Governing (1990-2000 above) should be an important reminder that data isn’t everything. Especially when it comes to discussions around gentrification we cannot limit ourselves to the hard data collected in the census because gentrification is a social and political phenomenon. Indicators are important and these particular pieces of data do help to look at the issue of gentrification (rising prices, etc. ), but the most important data to examine is the process of gentrification, not simply the outcome. What policies have contributed (i.e. redlining, reverse redlining), what political moves are making it more difficult (i.e. water shutoffs and foreclosure), and where are foundations, city government, and others focusing money for new investment. 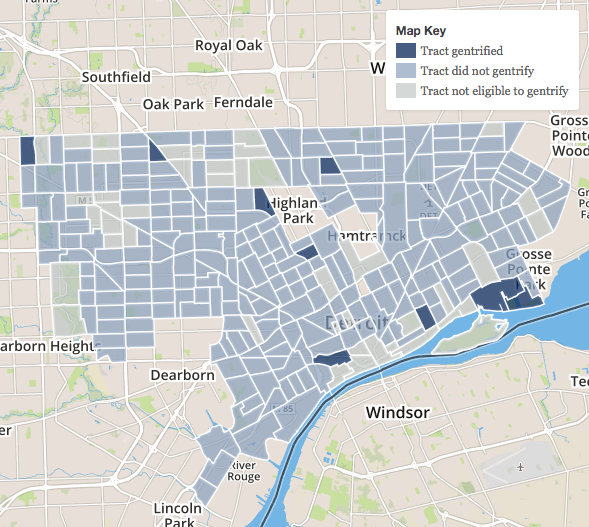 I would argue that these maps don’t tell the story of gentrification at all, but rather the impact of further disinvestment of the neighborhoods where Detroit residents live. As census tracts/ neighborhoods lose population, those who are able to stay are more likely to have higher income, education, etc.